The Mayor of Clendenin, WV shares her experiences during the 2016 floods. The Tanner family was able to move their house to a new property a few miles away. KANAWHA COUNTY, W.Va. (WCHS/WVAH) — Saturday marks two years since devastating floods hit West Virginia, destroying homes and lives. In Kanawha County, Clendenin was one of the areas hit the hardest by the 2016 flood, the rebuilding continues there today. The Tanners are just one of the hundreds of families displaced by the flood in and around the town of Clendenin. They remember June 23, 2016 like it was yesterday. “I was out work, and my husband called and said our house was starting to flood,” said Jennifer Tanner. In the weeks and months following the catastrophic flooding that swept across much of West Virginia in June 2016, “I never thought we would still be doing recovery work two years later,” Kanawha County Commission President Kent Carper said on Wednesday. “But here we are, in our last meeting before the two-year anniversary of the flood, still dealing with it,” Carper said, before he and other commissioners voted to provide $15,000 for building supplies for use by volunteers in repairing 75 flood-damaged Kanawha County homes this summer. During a nine-week period this summer, 900 Group Workcamps Foundation volunteers have made commitments to work on flood repairs in the Clendenin and Elkview areas, with followup work to continue for five additional summers, Clendenin Mayor Shana Clendenin told commissioners. CHARLESTON, W.Va. (WCHS/WVAH) — Rainy nights like Thursday are still difficult for victims of the 2016 historic flooding that swept across the state killing 23 people and destroying hundreds of homes across several counties. Saturday will mark the two-year anniversary, and still, many people are in desperate need of help. Even though the list of needs is still long, the Greater Kanawha Long-Term Recovery Committee is running out of money and will soon close, and with many families still waiting on the help they were promised by RISE West Virginia, the recovery committee doesn’t intend for its recovery efforts to stop when the funding does. A committee set up to help Kanawha County recovery in the wake of the June 2016 flood is running out of money and phasing out. John Ballengee, interim chairman of the Greater Kanawha Long-Term Recovery Committee, estimates the panel has enough money to handle 10 to 15 more needs in the next 60 or so days, depending on the cases that are presented. “While we continue to fund unmet needs with the funds we still have available, we’re probably not going to continue that when our funds dry up,” Ballengee said. Ballengee said that when the committee was very active, about a year to 18 months after the flood, it had volunteers from as many as 40 agencies. It employed a director and some case managers, he said. The committee’s director, Susan Jack, still intends to continue flood recovery work, though. 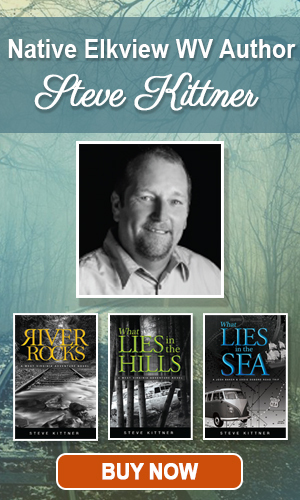 Jack will work as a consultant for Praying Pelican Missions, a domestic and international Christian missions organization. The group is setting up a space in the former Clendenin Church of God building, Jack said. 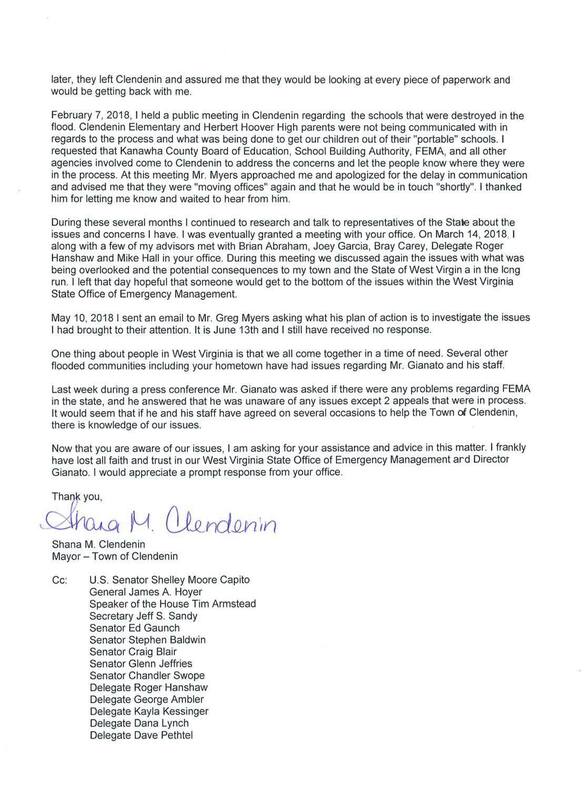 CLENDENIN, W.Va. – Recently, I had the opportunity to sit down with the Town of Clendenin’s mayor, Shana Clendenin to go deeper into the letter she hand delivered to Governor Jim Justice on Wednesday, June 13, 2018. In addition, she copied and hand delivered the letter to the following state officials to inform them of the difficulties the Town of Clendenin had experienced when reaching out asking for assistance from the State of West Virginia. 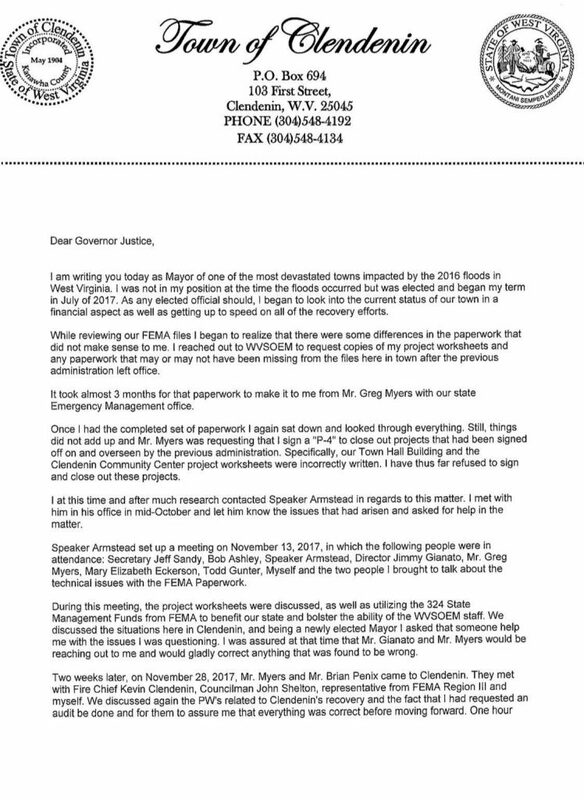 Below is the two page letter by Mayor Shana Clendenin which provides a detailed account and timeline of her attempt to request help from employees with the West Virginia State Office of Emergency Management including Director Jimmy Gianato, House Speaker Tim Armstead, and members of the Justice Administration over the past year. I invite you to listen to my interview with Mayor Shana Clendenin where she provides a detailed firsthand background of the challenges she and her administration has been faced with since taking office in July of 2017 as a result of the 2016 Flood. 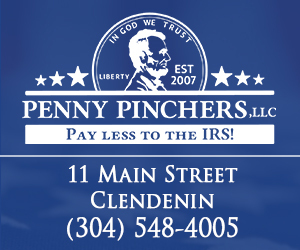 Also, the mayor gives us an update on the 1st Annual Clendenin Homecoming Festival that kicks off on Friday. George Lesson, Jr., of Elkview, stands by the door of his trailer, which was severely damaged by the June 2016 flood. After he denied a new trailer from RISE, he’s been working to repair the old one. Gazette photo. LESLIE — When John Harris and his family moved into their church’s parsonage, it was supposed to be a temporary solution. The 40-year-old’s home in Leslie, Greenbrier County, was damaged beyond repair during the June 2016 flood. His church took them in last October, and they signed a three-month lease. They expected to be in a new home built by the state’s RISE program soon after. RISE first told him he’d have a new house by Thanksgiving, Harris said — then by Christmas, then by February. Four months later, in early June, they were still waiting. CHARLESTON, W.Va. — Gov. Jim Justice has called a news conference for Friday morning about long-term flood relief. The governor’s press conference is to start at 9 a.m. Friday. He and Gen. James Hoyer of the West Virginia National Guard had said last week that they would likely provide a Friday update on the RISE flood recovery program.